The National Water Carrier of Israel (Hebrew: המוביל הארצי‎, HaMovil HaArtzi) is the largest water project in Israel. Its main task is to transfer water from the Sea of Galilee in the north of the country to the highly populated center and arid south and to enable efficient use of water and regulation of the water supply in the country. Up to 72,000 cubic meters (19,000,000 U.S. gal; 16,000,000 imp gal) of water can flow through the carrier each hour, totalling 1.7 million cubic meters in a day. Most of the water works in Israel are combined with the National Water Carrier, the length of which is about 130 kilometers (81 mi). The carrier consists of a system of giant pipes, open canals, tunnels, reservoirs and large scale pumping stations. Building the carrier was a considerable technical challenge as it traverses a wide variety of terrains and elevations. Early plans were made before the establishment of the state of Israel but detailed planning started only after nascent Israel's formation in 1948. The construction of the project, originally known as the Jordan Valley Unified Water Plan, started in 1953, during the planning phase, long before the detailed final plan was completed in 1956. The project was designed by Tahal and constructed by Mekorot. It was started during the tenure of Prime Minister David Ben-Gurion, but was completed in June 1964 under Prime Minister Levi Eshkol, at a cost of about 420 million Israeli lira (at 1964 values). The National Water Carrier was inaugurated in 1964, with 80% of its water being allocated to agriculture and 20% for drinking water. As time passed however, increasing amounts were consumed as drinking water, and by the early 1990s, the National Carrier was supplying half of the drinking water in Israel. According to forecasts, by the year 2010 80% of the National Carrier will be directed more at providing drinking water. The reasons for the increased demand for drinking water was twofold. Firstly, Israel saw rapid population growth, primarily in the center of the country which increased demands for water. Furthermore, as the standard of living in the country rose, there was increased domestic water use. As a result of the 1994 Israel-Jordan Treaty of Peace, among other items, Israel agreed to transfer 50 million cubic metres of water annually to Jordan. Water first enters the National Water Carrier through a several hundred meter long pipeline which is submerged under the northern part of Sea of Galilee. The water passes into a reservoir on the shore and then travels on to a pumping station. The pipeline is made up of nine pipes which are joined by an internal cable threaded through them. Each of these pipes includes twelve concrete pipes, each five meters long and three meters wide. As these pipes were cast, they were encased in steel pipes, sealed at the ends and floated out onto the lake. A winged star-shaped cap is mounted in a vertical section of the underwater pipe to allow water to be taken in from all directions. Water travels to the Sapir Pumping Station on the shore of the lake where four horizontal pumps lift the water into three pipes which subsequently join to form the pressure pipe, a 2,200-meter (7,200 ft) long steel pressure resistant pipe which raises the water from -213 meters below sea level to +44 meters. From here, the water flows into the Jordan Canal, an open canal. This runs along a mountainside for most of its 17 km (11 mi) route. When full, the water in the canal is 2.7 meters (8.9 ft) deep and flows purely by gravity apart from where two deep wadis intersect the course of the canal (Nahal Amud and Nahal Tzalmon). To overcome these obstacles, water is carried through steel pipes shaped like an inverted siphon. The canal transfers the water into the Tzalmon Reservoir, a 1 hm3 operational reservoir in the Nahal Tzalmon valley. Here, the second pumping station in the course of the Water Carrier is located, the Tzalmon Pumping Station which is designed to lift water an additional 115 meters (377 ft). Water then enters the Ya’akov Tunnel which is 850 m (2,790 ft) long and 3 meters in diameter. This flows under hills near the village of Eilabun and transfers the water from the Jordan Canal to the open canal crossing which crosses the Beit Netofa Valley – the Beit Netofa Canal. The Beit Netofa Canal takes the water 17 kilometers and was built with an oval base due to the clay soil through which it runs. The width of the canal is 19.4 meters, the bottom is 12 meters wide and it is 2.60 meters deep, with the water flowing through it at a height of 2.15 meters. 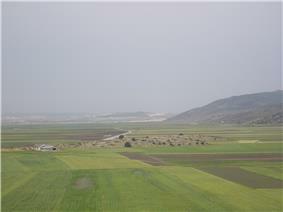 At the southwestern edge of the Beit Netofa Valley are two further reservoirs. The first of these is a sedimentation pond, holding about 1.5 million m³ of water which allow suspended matter in the water to settle to the bottom, thus cleaning the water. The second reservoir is separated from the sedimentation pond by a dam and has a capacity of 4.5 million m³. Here the inflow of water from the pumping stations and open canals is regulated against the outflow into the closed pipeline. The amount allowed through depends on water demand. A special canal bypasses the reservoirs allowing water to travel straight through the carrier. Before entering the closed pipeline, final tests are performed on the water in the carrier, with chemicals added to bring the water to drinking standards. In 2008 Mekorot completed construction of an advanced filtration plant, the fourth largest in the world, to further cleanse the water before entering the 108" Pipeline which transports it 86 km to the "Yarkon-Negev" system near the city of Rosh HaAyin to the east of Tel Aviv and Petah Tikva. The initial idea of a National Water Carrier followed the proposal of several solutions for the water problems of Palestine put forward before the establishment of Israel in 1948. Early ideas appeared in the 1902 book Altneuland by Theodore Herzl in which he talked about utilizing the sources of the Jordan River for irrigation purposes and channeling sea water for producing electricity from the Mediterranean Sea near Haifa through the Beit She'an and Jordan valleys to a canal which ran parallel to the Jordan River and the Dead Sea. An earlier water development scheme was proposed by Walter C. Lowdermilk in his book Palestine, Land of Promise, published in 1944; it was developed with human and financial assistance from the American Zionist Emergency Council. The book became a bestseller, and important in swaying the debate within the Truman administration concerning immigrant absorptive capacity and the Negev as part of Israel. His book served as the basis for a detailed water resource plan which was prepared by James Hayes, an engineer from the USA, who proposed utilizing all water sources in Israel (2 km³ per annum) for irrigation and the production of electricity. This would involve diverting part of the Litani River water to the Hasbani River. 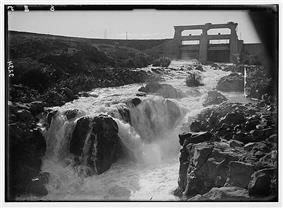 This water which would be further transported by a dam and canal to the area south of Tel Hai, from where it would be "dropped" to produce electricity. Water would also be carried from Tel Hai to the Beit Netofa Valley which would become a national water reservoir, of about one billion cu.m. volume (one quarter of the Sea of Galilee's volume). An electricity generating station would be located at the reservoir's outlet, from where the water would flow into an open canal to Rafiah, which, whilst travelling south would collect water from wadis and streams, including the waters of the Yarkon River. Hayes also asserted that the Yarmouk River would be channeled into Lake Kinneret, in order to prevent a rise in its salinity which could come about as a result of the diversion of the River Jordan, and that a joint Israeli-Jordanian dam about 5 km east of kibbutz Sha'ar HaGolan would be constructed. The Hayes plan was designed to be implemented in two stages over a 10-year period, but never materialised due to its economic infeasibility and lack of cooperation by Jordan. Since its construction, the resulting diversion of water from the Jordan River has been a source of tension with Syria and Jordan. In 1964, Syria attempted construction of a Headwater Diversion Plan that would have devoid Israel from using a major portion of her water allocation, sharply reducing the capacity of the carrier. This project and Israel's subsequent physical attack on those diversion efforts in 1965 were factors which played into regional tensions culminating in the 1967 Six-Day War. Israel captured the Golan Heights from Syria in the course; the Heights contain some of the sources of the Sea of Galilee.